Swing sets can be built in a variety of places around the yard, and a variety of different swing sets can also be set up depending on how big you want to set to be. These are all things you can easily do yourself based on the layout of your backyard and the swing set materials at your disposal. Set up your swing set in an area of your backyard with a lot of area in front and behind it. Whoever is swinging should be able to swing freely without worrying about clipping his legs on any objects or swinging over any treacherous areas that would hurt someone who falls. Ideally there shouldn't be a front or back to the swing set, and whoever is using it should be able to swing either way. 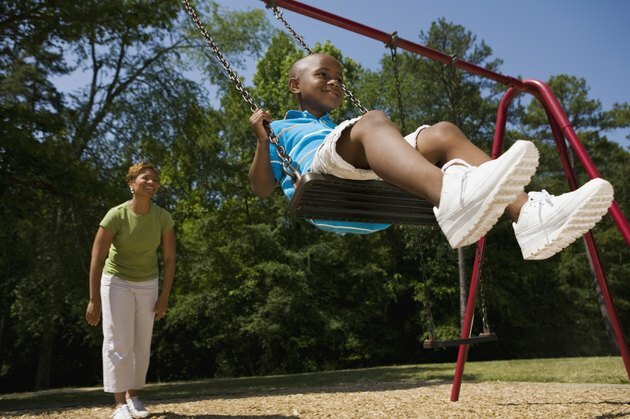 The area beneath the swing set is important to take into account as well for the safety and comfort of those who are on the swing set. Thick rye grass is a good thing to add to the area around the swing set. Sand will also work. About two inches evenly spread beneath the swing set will help absorb the shock from jumping off or falling from the swings while they are in the air. Gravel will also help this, but it is a little rougher and can still cause injury. There are numerous sizes and designs of swing sets that you may want to consider. A wooden swing set can be built yourself in your backyard. The wood should be treated so that it doesn't weather and decay in rain and sun. The swinging is a bit different on a wooden swing set as well, as wooden swing sets have a little more give to them than metal swing sets. Metal swing sets are heavier and smoother to swing on. However, these sets are often more difficult to assemble. Both of these sets should have their legs buried in the ground, even with cement, for optimal stability.